That little Instagram message sparked the idea for this whole blog post! And to be fair, this isn’t the first time I’ve been asked this question. However, THIS TIME, I decided to track the answers and create a resource I can direct other nurses to next time this question comes up! With 15% of the vote specifically calling out Brooks, these were the favorite among this group of nurses! They are an investment, but these shoes have a following of devoted fans that extends beyond healthcare and into the athletic world! The are known for being a quality running shoe that cushions impact to protect your joints, and people rave about how comfortable they are! I assure you, you don’t need to be a runner to own a pair of these and be able to fully appreciate them. The only con I can think of (and this applies to all tennis shoe styles), they are susceptible to body fluids and could be difficult to sanitize or clean. If you want to protect your fancy shoes, I’ve heard of some ICU nurses buying waterproof shoe covers they can easily wipe down at the end of the day! 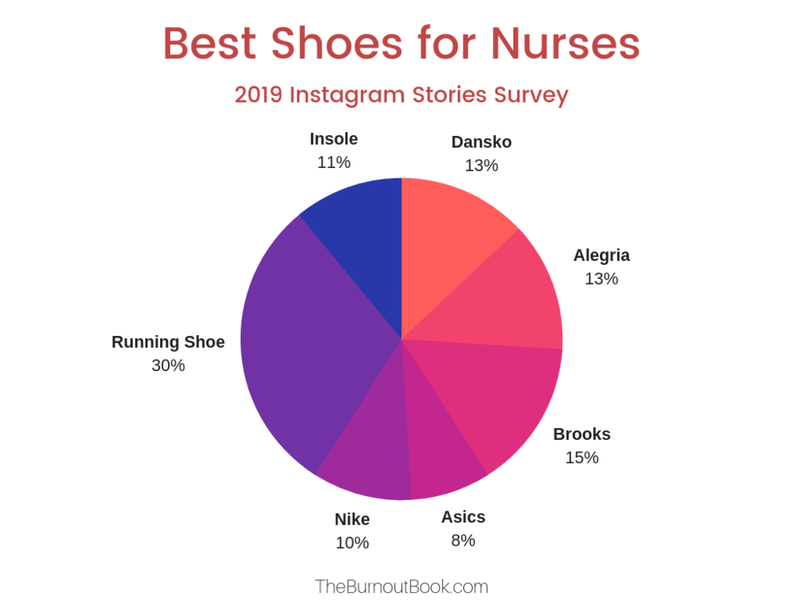 Dansko shoes are still holding strong as a nurse favorite, tying with Alegria with 13% of the vote! It makes sense, both are sold options for a clog shoe and are easy to clean with a sani-wipe after being in an isolation room. Nurses love the fact that they provide great arch support and come in a ton of cute designs! The main cons you’ll hear about Danskos have to do with the fact that they are heavy and can be an ankle-twisting hazard when trying to sprint down the hall to respond to a bed alarm or a Code Blue! That being said, they are still a popular shoe and many people can handle walking/running in them just fine. They’re worth trying out! As mentioned above, Alegria shoes tied for second place in this poll with Dansko! There are less stories of twisting ankles with these ones, so they’re definitely a good option! They also come in a lot of colors and designs, so it can be a fun way to express your personality when work has you wearing a standard color uniform. It’s a quality shoe that can last quite a while and again, is easy to sanitize at the end of the day. Another quality running shoe takes third place in this poll. Nike has tons of style options and colors to pick from which can make shoe shopping fun or overwhelming, depending on the person! They’re well known for having a shoe for any activity: walking, running, basketball, golf, soccer, tennis, and more! They don’t have a “nursing” category yet, but you’re bound to find something in their collection that will fit within your budget. Asics was mentioned several times in this survey and ended up with 8% of the vote. They are known for having some quality running shoes with some really fun colors to pick from! A little less well-known than some of the others already mentioned, but nothing a little word of mouth between nurses won’t fix. 30% of the people who responded to the survey voted for either “running shoe” or mentioned a specific brand that wasn’t mentioned by anyone else, so that’s why it fell into this category. Some examples include: Saucony (two votes on that one actually), Sketchers, Converse, Crocs, NOBULL, New Balance, Infinity by Cherokee Fly shoes, Earth Shoes, Sanita, HOKA ONE Bondi, and Mizuno. Remember, ALL of these were recommended by a someone who is a nurse! Each of them have slightly different styles and selling points, so do some research and find the pair that you think will be a good fit! To finish this post off, we need to talk about insoles! Quite a few nurses actually made a point to mention that they find a pair of shoes and add a comfortable insole and THAT makes all the difference. Superfeet insoles were mentioned a couple of times, but again, there are tons of options so do some research. Insoles typically require some break-in time, so I don’t recommend popping them into your shoes and wearing them for 12 hours on the first day! Overall, as far as style goes, running shoes beat out clogs! Most nurses find a brand they love and swear by it. Multiple people called out the fact that your feet feel better when you alternate between two pairs of shoes! I also highly recommend this tip! Having a good insole can be more important to some people than the brand of shoe they buy. No matter what pair they pick, I’ve talked to many nurses who choose to keep their work shoes quarantined from their pets or children and leave them at work, the car, or the garage. Because, let’s be honest, hospital floors are really just one big petri dish of bacteria. There you have it! Hopefully this will help you narrow down your search a little bit. Let me know what shoes you’re wearing in the comments below and if you’d recommend them to a nurse!